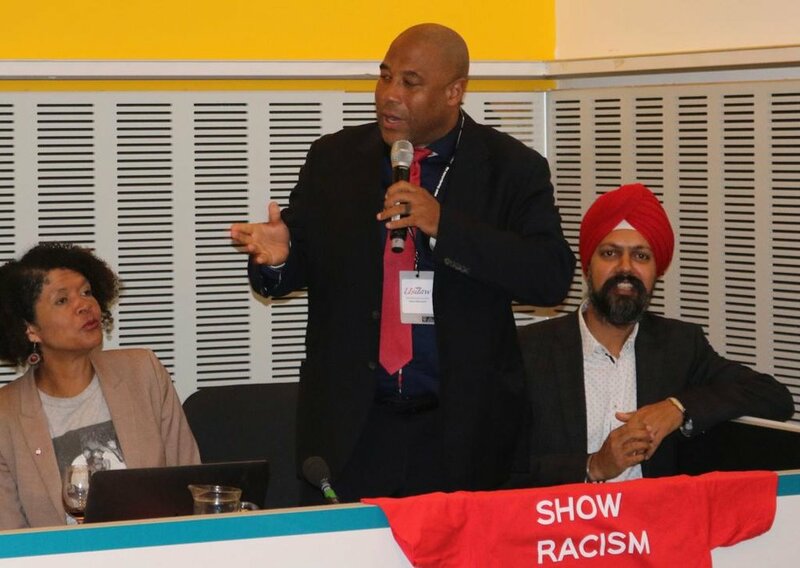 On Tuesday 25th September, Show Racism the Red Card held a fringe meeting at the Labour Party conference. The fringe meeting saw a number of Politicians, political figures and special guests speak about their experiences of racism, how they believe we should tackle racism and why they support Show Racism the Red Card. The first person to address the packed out room was Chi Onwurah MP (Member of Parliament for Newcastle upon Tyne Central). Chi spoke about her experience’s of racism while growing up in Newcastle and how proud she was of how far we as a society have come with tackling racism and the far-right. Following on from Chi was Jo Stevens MP (Member of Parliament for Cardiff Central). Jo spoke about her involvement with Show Racism the Red Card and her role as the Chair of the Show Racism the Red Card All Party Parliamentary Group. John Barnes (Former England and Liverpool footballer) was next to speak and John spoke about how he views racism and that we should change attitudes in society if we wish to tackle racism. David Lammy MP (Member of Parliament for Tottenham) was the next guest speaker and David delivered a passionate speech about changing the way we teach the history of this country and subsequently, how we talk about racism. Len McCluskey (General Secretary, Unite the Union) and Dave Prentis (General Secretary, UNISON) were next to speak and both spoke about how proud they were that each of their respective Unions supported the work of Show Racism the Red Card and that they had witnessed first-hand the impact of Show Racism the Red Card’s anti-racism education on young people. Kevin Courtney (Joint General Secretary, NEU) was next to speak and he informed the audience of just how important it is to support Show Racism the Red Card. He went on to explain to the audience how the organisation allow young people to express their views and then challenge them in a way to help educate them on racism. And finally, Tanmanjeet Singh Dhesi MP (Member of Parliament for Slough) finished off the fringe meeting by congratulating Show Racism the Red Card Chief Executive, Ged Grebby, and his team for all of their hard work. Show Racism the Red Card would like to say a massive thank you to all of the speakers for taking the time to address the audience and speak so passionately in support of Show Racism the Red Card. Thank you also to Unite the Union for sponsoring the event and providing a platform for the organisation to promote the work it carries out. And finally, thank you to all the visitors and delegates who came along to listen the the line-up of speakers and support the campaign.